Meditation, derived from the Latin word ‘meditatio’ meaning “to think, ponder, and contemplate”, is a conscious state of self-awareness, self-reflection, and self-expression. Meditation is a condition of receptiveness to curiosity in which a man or woman effectively develop refinements of reality rather than discernment. This article is about gratitude meditation – a unique practice that focuses on acquiring awareness through feelings of gratefulness, and fosters happiness and positivity in our daily lives. “Go within every day and find the inner strength; so that the world will not blow your candle out.” – Katherine Dunham. The simplest form of meditation is breath control, where we focus on our breathing pattern. We consciously notice each inhale and exhale and bring back our awareness to the breath observation the moment we notice it going astray. Research suggests that since our brains are creative and crave for expressing themselves, giving it the space to cultivate its power and focus on nothing but itself, can calm the raging storms inside. Gratitude meditation is a conscious effort to appreciate what makes us feel good. It is tied in with opening our hearts and embracing the blessings we have. 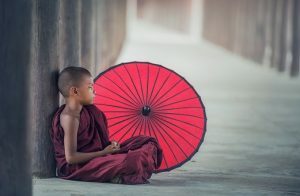 Many Buddhist monks and nuns actively practice gratitude meditation at the beginning and end of their days to pay tribute to everything that helped them survive that day, including their sufferings. Gratitude meditation has been there since ages – both in the spiritual and the non-spiritual fields. Unlike conventional meditation practices that need physical arrangements like posture, illumination, or sound adjustments, gratitude meditation is more flexible and can be practiced in a variety of settings for a short or long duration. Gratitude meditation gives us the power to face our weaknesses and acknowledge the darker sides of life. It guides us to accept them, learn them, and grow with them. And here is what we get from practicing it. Gratitude meditation brings in feelings of heightened positivity and happiness that lasts forever. The peace that we derive from being grateful in the meditation session gives us the power to realize that happiness does not lie in momentary pleasures and that we cannot be happy if we equate it with mundane gains and profits. (Emmons, R. A., & McCullough, M. E. 2003). Materialism is one of the roots of unhappiness, as many psychologists have suggested, and the only way to not let it overpower us is by practicing and internalizing gratefulness and mindful awareness (Emily L. Polak Michael E. McCullough, 2006). For example, having an ice cream can make you feel good instantly. But when you buy your kid his favorite frozen cup and see him relishing it, isn’t that joy beyond all the material pleasures? Gratitude meditation improves social relationships and helps in sustaining them for a lifetime. In an evaluative study on the relationship between gratitude and the quality of life, it was found that participants who scored high on gratitude assessments had better social functioning and were great listeners. Besides, gratitude was found to impact all the five traits of the Big Five Theory of Personality. All participants, no matter what personality traits dominated them, showed an equal amount of satisfaction when they practiced gratitude exercises (Wood, Joseph, Maltby, 2008). As we feel more grateful and content in our daily lives, normal body mechanisms like the sleep-wake cycle improve significantly. Research has indicated that gratitude meditation is directly associated with subjective feelings of better and longer sleep. Besides, it also shields us against stress by helping us look into the problems with a calm mind and resolve them efficiently, instead of reacting to them adversely. “The thoughts manifest as the word; The words manifest as the deed; The deeds develop into habits, And habit hardens into character” – Lord Buddha. Simple meditation practices like mindful breathing or body scan techniques can bring a sense of awareness and freedom. But, when we add a gratitude adjunct to the meditation practice and mindfulness practice, we create an ambiance of wholesome positivity and strength. True happiness can be found not by looking at the positive things only, but rather by being aware of the negative things and choosing not to let them affect our well-being (Myers and Diener, 1995). The secret of gratitude practice is that it cultivates the power to reform our thoughts from the very roots of the subconscious mind. Through meditation, the mind melts away the worries, anxieties, insecurities, and all those negative emotions that were clogging it. With a clear unadulterated mind, we can then contemplate on what we are grateful for in life and rejoice the newly discovered self-mastery. Research shows that people who practice gratitude meditation regularly have a well-balanced blood pressure level, better metabolism, and enhanced mood conditions. In a study on suicidal ideations, it was found that higher levels of gratitude were associated with fewer suicidal thoughts and attempts (Kleiman, 2013). The reason is simple. By focusing positively on the wrong sides of life, we can change the way we think and feel about them. Studies indicate that gratitude yoga and meditation have significant effects on reducing symptoms of depression, mood disorders, and suicidal thoughts (Stockton, 2016). A recent survey that was conducted on the benefits of gratitude exercises by O’Leary in 2015 suggested that individuals who maintain gratitude journals or practice self-reflection are much better at expressing themselves and are more aware of their inner feelings. Furthermore, the findings also correlated gratitude meditation with higher levels of motivation and a self-driven nature. “Happiness will never come to those who fail to appreciate what they already have” – Lord Buddha. Yoga and meditation are often mentioned in the same line, gratitude being an integral link to both of them. Yoga is the way of life that ‘yogis’ or ancient learned people in the Hindu culture adopted. The ‘yogic’ lifestyle was a combination of healthy eating, healthy exercise, and rigorous learning. It encouraged coexistence with Nature and followed a here-and-now principle of sustenance. After its adoption in Buddhism, yoga expanded to include meditation, self-control, discipline, and complete awareness of mind and body – the ‘yoga’ that we practice today. Buddha believed that every human birth is worthy of gratitude. By merely thanking our existence, we can feel a lot more empowered and connected to ourselves. Gratitude meditation is the simplest way that we can choose to follow the ‘Dharma’, (the ‘truth’ or the ‘way things are’) in our everyday lives. Yoga and meditation make gratitude easy to express. For example, in Savasana (The Corpse Pose), when we lie on our back and bring our whole body at a resting position, we cherish the breath we are taking, savor the air on our skin, and feel the stretch in our muscles. Our mind and body pace together that very moment. All the weariness of the muscles and the stress of life melt away when we lie flat on our back with our eyes closed – and that is gratitude at its peak. “Remember to breathe. It is after all, the secret of life” – Gregory Maguire. Gratitude is the highest level of thought (G.K. Chesterton), and it comes in two ways – by conveying thankfulness to someone or by receiving the same from him/her. Gratitude is far from the scope of constant happiness and ecstasy. Instead, it is the practice of facing the difficulties with an open heart – it lets us accept our problems and guides us to choose a better way of living despite all troubles. Gratitude exercises can be as simple as writing notes, complimenting ourselves, smiling more at others, appreciating the Nature, or making gratitude visits to people whose support changed our lives. We heal by expressing our gratefulness to others – and undoubtedly, yoga is one of the best ways to do so. There are two ways by which we can express gratitude through yoga. Mudras are the yoga gestures we do with our hands. Mudras redirect life energy to the body. It is a gesture of offering that helps to stimulate the different areas of the brain that makes us feel at peace. There are different Mudras that we can practice, each having its exclusive benefits. Some of the basic mudras were mentioned by yoga enthusiast and wellness coach Kaisa Kapanen, in one of her recent publications. Asanas are the physical postures that we let the body acquire during a yoga session. We have heard of the word ‘yogasana’ which is nothing but the combination of the two words yoga and asana, and involves practicing different body postures to cultivate feelings of joy, satisfaction, and gratefulness. More on these discussed below. Yoga gratitude is all about slowing down, breathing in, and letting us appreciate the present moment and everything that we ‘now’. Through self-love and awareness, yoga gratitude prepares us to express our gratefulness to others. The first step to any gratitude practice is the intention to do it and enjoy the experience. When you sit for a gratitude meditation practice, it is vital that you are aware of what you are doing and why you are doing so. For gratitude meditation and yoga, there should be a firm intention of appreciation and acknowledgment. Yoga is another name for self-discipline. Those few minutes on the yoga mat are yours, and you must utilize it fully. Commit to yoga practice to experience all the fantastic things you are capable of doing, and gratitude will flow instantly into yourself and spread over all other areas of your life as well. Gratitude yoga is goal-directed. It may or may not yield immediate results, but each time you make progress, each posture you acquire, should be an attempt to feel more grateful of your body and thank yourself for giving the time to experience this bliss. When your intentions are honest, you have committed to ‘yogic’ thankfulness, and you have acquired a pose, the next step will be to focus on yourself and your body. Slowly, you will realize that your mind doesn’t feel perplexed or stressed anymore. You have liberated yourself from the shackles of your negative contemplations and emotional turmoils. When we are grounded, we are more appreciative and less self-defeating. An excellent way to incorporate grounding in gratitude yoga is to start and end the session with breath control or muscle relaxation. Breath control allows us to tune into ourselves and question the beliefs that make us suffer. Tiffany Cruikshank, a leading yoga trainer and a specialist in oriental yoga medicine for sports and orthopedics, says that Sukhasana, a simple cross-legged sitting posture is vital for deriving gratefulness through yoga. “The quieter you become, the more you can hear” – Baba Ram Dass. Guided meditation is performed under the supervision of a narrator who takes us through the different stages of inculcating gratitude. Thanks to the concept of neuroplasticity, we now know why guided meditation is the best for practicing gratitude. Neuroplasticity explains that the brain has the power to shape and reshape itself according to our thoughts, feelings, and environment. It suggests that the mind is unable to differentiate between real events and imagination. For example, in guided meditation, when the instructor asks us to imagine something good, the brain takes it to be a real experience, and forms neural networks making us feel the real emotions associated with the imagery. By changing the way our brain works, guided meditation has the power to alter our psychological functioning. The narrations can activate our muscles, change our biological functioning, and improve the way we combat stress. Guided meditation reprograms the mind by accessing the subconscious and the unconscious layers and resolving the underlying conflicts that we might not have been consciously aware of. Daily practice – Consistency is vital for any meditation. To explore and enjoy the full benefits of guided meditation practice, it is vital that we commit to daily practice. Location and time – The brain works in strange ways. If we choose a particular time and place for practicing guided meditation every day, chances are better that we will benefit from it more. Most practitioners recommend using a comfortable spot for meditation practice that is free from excess light, sound, or physical distractions. The right posture – The ideal guided meditation posture is a comfortable sitting position with the neck extended and the back straight. The proper stance allows smooth blood circulation and breathing. A tired body may tend to slouch the back or fold the legs, but it is vital that we correct the posture every time it goes wrong. Zero judgment – The first time may be a complete failure. But we must not let it overrule our commitment to daily practice. The mind may wander, get distracted, or get disappointed by the underachievements, but our goal is to prevent this frustration and look beyond the temporary obstacles. “Meditation means dissolving the invisible walls that unawareness has built” – Sadhguru. Guiding light is an online blog that focuses on meditation training and awareness. The guided gratitude meditation script that they follow is based on one of the retreats of the famous meditation mentors, Mr. Deepak Chopra. The gratitude meditation gently guides the follower through a serene path of inner peace and wisdom. Starting from expressing gratitude to our breaths, heartbeat, the five senses, and finally, to the people we love, this meditation awakens our consciousness in the gentlest way possible, leaving us refreshed and emotionally satisfied from inside. You can listen to the audio script of this meditation or follow the written format and practice it yourself. Change to chill is a web-based organization that helps people, including children and adolescents, to beat stress and develop emotional resilience. Out of their numerous self-help resources of mindfulness and meditation, the gratitude meditation script is worth mentioning. It is an emotion-focused practice, and, like most gratitude meditation practices, begins with breath control. Once the follower is immersed into the process, the narrator slowly progresses toward shifting the focus to our innermost emotions of love, affection, care, and empathy. It lets us confront our positive energy and express gratitude to ourselves and others. You can have a closer look at this meditation script and incorporate it as a part of your daily gratitude practice. Krista, the founder and mentor of Flourish yoga, dedicated her Canada-based organization to promote awareness for a healthy lifestyle. Her blogs and training manuals contain all the know-how of proper diet, active lifestyle, yoga, and meditation. The gratitude meditation script that she has developed is relaxing and can be practiced during any time of the day. It is flexible, nourishing, and awakens our bodily senses instantly, making us more mindful of the present. The full audio script, with description, is available on her website. In a recent article on gratitude meditation, author Kasey Carrington presented a unique compilation of some of the most popular guided gratitude meditation scripts. The practices include short, and long texts explained by different practitioners and well-established meditation mentors, and is an all-in-one collection of gratitude meditation scripts. Deepak Chopra, an American author, and motivator of Indian origin, is one of the most valued meditation trainers and alternative medicine specialists of today. His gratitude meditation script has found a worldwide acceptance and is extremely helpful for those who are looking for a vent to let out the negative emotions and stress. The Mindfulness Gratitude Meditation is a free exercise posted by Mindfulness Exercises, a site that is dedicated to providing valuable mindfulness and meditation resources for professionals of all levels. You can follow their script here. Josie Robinson, the author of the book ‘Gratitude Jar: A Simple Guide To Creating Miracle’ is a wellness counselor who believes anything can be achieved if we are grateful from the inside. She suggests that the best way to start a day is by expressing gratitude to everything that helped us sustain yesterday and gives us the hope of living today. By merely listening to these mantras being chanted or saying them ourselves and internalizing their meanings, we can feel more aware of our senses and be thankful for what this moment has to offer to us. Let us have a look at five such Sanskrit mantras that enhance gratitude and should be an essential component of our daily gratitude meditation. Matt Caron, a dedicated yoga practitioner, and mentor, described some Sanskrit mantras for gratitude meditation. 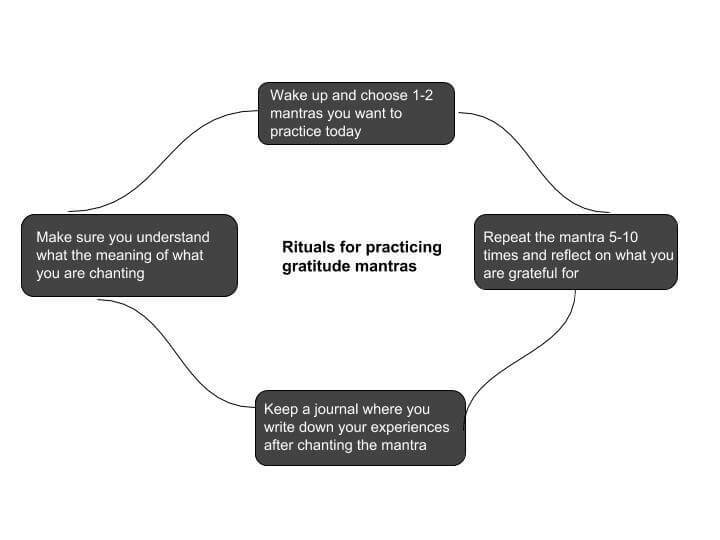 These mantras, as he mentioned in his article, are powerful enough to dissolve any resistance to gratitude in our minds, and should be an essential part of all gratitude meditation exercises. Many yoga and meditation sessions begin and end with this mantra. By expressing our acknowledgment to ourselves in this mantra, we let way for universal acceptance and forgiving. This one word has the power of teaching the mind that there is goodness in ourselves and everyone around us, and greeting them with positive energy is what this mantra is all about. Dhanyavad is a direct expression of gratitude. In gratitude meditation, we can repeat this mantra each time we thank ourselves or others. We can convey our thankfulness to the people who love us, to this life that we are living, and to the Almighty for showering His blessings on us. This simple gratitude mantra can address every little or big thing that deserves our gratitude. This mantra spreads self-awareness and allows us to accept that we are thankful. It lets us connect with the profound energies of the Universe and for a moment, take pride in the fact that we do have so much around us to be thankful for. In gratitude meditations, we can take short pauses to chant this mantra and internalize its meaning entirely. The word ‘Hum’ in Sanskrit (and Pali) means ‘I’ or ‘Me’, and ‘Karuna’ implies kindness and affection. This gratitude mantra is a powerful self-regulation and self-awareness tool that opens our mind to embrace the fact that we are kind, loving, and considerate. It lets us realize our virtues and see kindness in the self and others. By repeating this mantra, we choose to see the love that we have for others and the affection others have for us and be thankful for the peace and happiness that these beautiful feelings have given us. ‘Dhana’ means riches, and ‘Prani’ is an adaptation of the word ‘Pran’ or ‘Life’. This gratitude mantra reminds us of the real riches of life – our mind and our body. It tells us that the first thing that we should be grateful for is our body whose normal functioning allows us to experience everything good and bad – without the heartbeat, the blood flow, and the regular bodily functions; we are nothing but lifeless entities. With this positive acknowledgment, we can start looking at life from a broader perspective. Thanking your body for all the efforts it has made so far. This usually is the final resting position that we practice at the end of a yoga session. Get up with a long stretch or a big hug to yourself (arms embracing your knees in a lying position), and exhale with a deep ‘ahh’ sound with the intention to release all the pent up stress from your inside. To open ourselves and breathe fully, thereby, filling the mind and the body with pure gratitude. It is rejuvenating and can be done incorporated in any yoga sequence. Keep breathing till you are in the cobra position and release the pose with a deep sigh of relief. Come to a resting place with your chin touching the mat and hands by your side. To find gratitude in yourself and take a moment to appreciate your talents. This pose inspires us to summon resilience as we face a difficult situation in life. The challenges we face while practicing this reminds us of our courage and how it helped us to overcome adversities in life. This is a relaxing pose that we can practice alone or as a part of a gratitude yoga sequence. It lets the positive energy enter our body and instill hope into our hearts – a great way to express gratitude to our dreams that motivate us to keep trying. Notice how you feel and come back to rest. “Yoga is not about touching the toes. It is about what you learn on the way down” – Jigar Gor. We should be flexible to try new things and change our patterns anytime. Courses of gratitude yoga may be different for each one us, depending on our physical strength, mood, and other external factors. Here are some accessible yoga sequences that we can follow and include in our gratitude sessions regularly. Francesca Bove talked about this yoga sequence in her post on Sonima, an online meditation blog. Her process is simple and focus on suitable asanas that should be followed in the order she has mentioned. The stances include mountain pose, by side stretches, different variations of the lunge pose, warrior positions, and finally savasana as the ending supplement. This sequence is a blend of poses of varying levels of difficulty and can be practiced by anyone who does yoga daily. Learn more about this sequence from her article here. Yin Yoga is an advanced branch of yoga which is slow-paced and aims at increasing muscle strength and flexibility. With its deep-rooted connections in China, India, and North America, Yin practices are now popularly preached everywhere. An ideal Yin Yoga for gratitude includes poses and mudras like – reclined butterfly, pigeon pose, hero pose, and warrior positions with intermittent sessions of relaxation in between. An ideal sequence was mentioned by Nancy Nelson in her blog, where she has described all the poses with their correct order and durations. The goal is to make us more mindful, kind, and thankful for the present. Flow yoga or ‘Vinyasa’ is a popular yoga practice for enhancing strength and happiness. 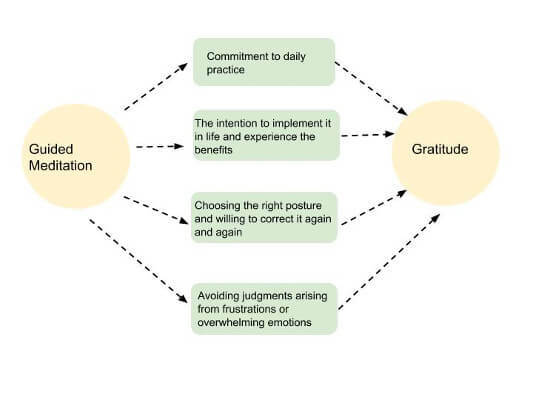 A flow sequence that promotes gratitude was mentioned by Ivonne Ackerman, a New York based yoga and wellness practitioner. The sequence starts from cognitive reformation, as Ivonne believes any change in the world begins with a thought. Her practice blends thought restructuring and physical activities that promote gratitude, and can be useful for beginners attempting yoga for the first time. Take a closer look at this gratitude flow here. “You yourself, as much as anybody else in this entire Universe, deserve your love and affection” – Buddha. Davidson, R. J., & Lutz, A. (2008). Buddha's brain: Neuroplasticity and meditation [in the spotlight]. IEEE signal processing magazine, 25(1), 176-174. Calzonetti, F. J., & Solomon, B. (Eds.). (2012). Geographical dimensions of energy (Vol. 5). Springer Science & Business Media. De Michelis, E. (2005). A history of modern yoga: Patanjali and western esotericism. A&C Black. Singleton, M., & Byrne, J. (Eds). Yoga in the modern world: Contemporary perspectives. Routledge, 2008. ManyThanks, for this comprehensive and well-researched article on Gratitude and the overall effect every facet of our lives. 😉 I look to incorporate some of what you have shared in my life and the lives of my clients.